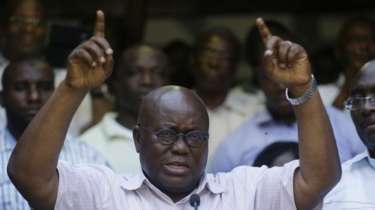 Ghana's opposition leader Nana Akufo-Addo has won Wednesday's tightly contested presidential election. The BBC reports that President John Mahama called Mr Akufo-Addo to admit defeat, a spokesman for his party said, as the Electoral Commission announced the result. Mr Akufo-Addo has promised free high-school education and more factories but critics have questioned the viability of his ambitions. Celebrations have broken out in the capital, Accra. Ghana has been a multi-party democracy since the end of military rule in 1992 and this result is seen as reinforcing its reputation for the peaceful transfer of power between administrations. Mr Akufo-Addo, from the New Patriotic Party, won the election on his third attempt to reach the presidency, after a campaign dominated by the country's faltering economy. "I make this solemn pledge to you tonight: I will not let you down," he told a jubilant crowd in front of his residence. "I will do all in my power to live up to your hopes and expectations."